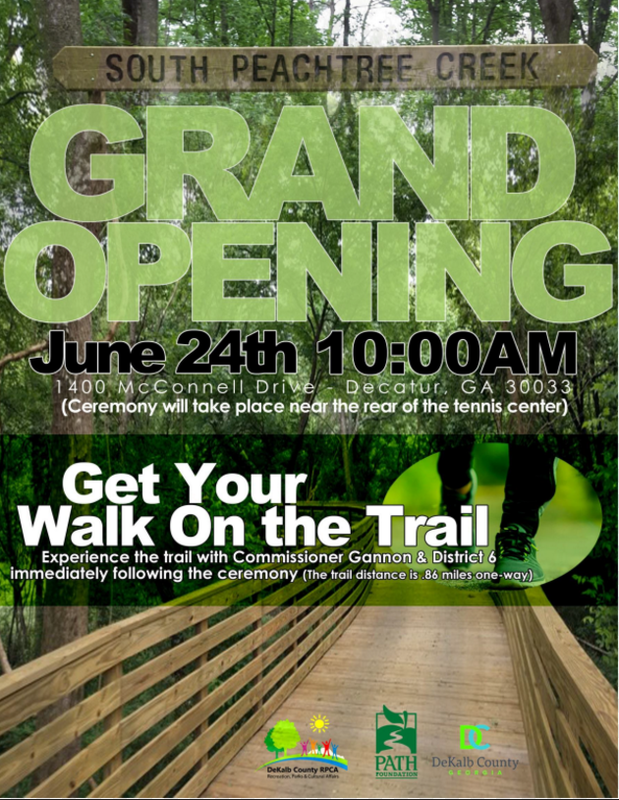 A new section of the South Peachtree Creek PATH opens this week. For several years now, we have been enjoying the PATH that connects Medlock Park to Mason Mill Park. This new section creates a connection to North Druid Hills Rd. The AJC reported on this extension here (bonus: short video of the trail as experienced on a bike). UPDATE: PATH's updated trail map appears below. 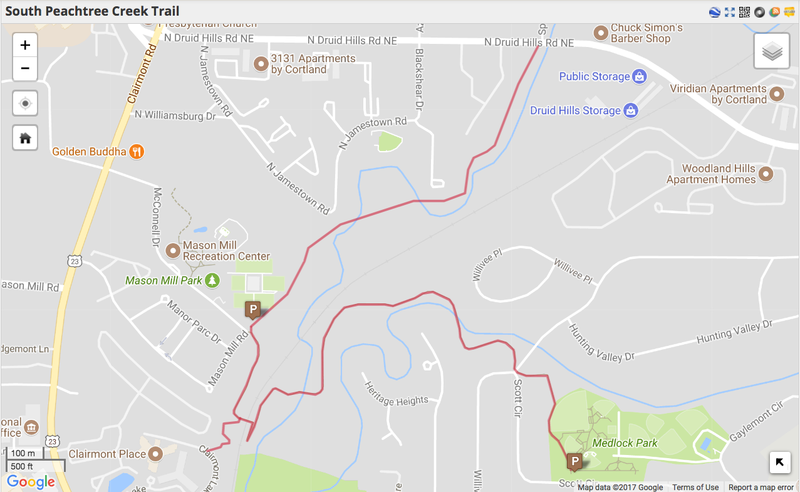 The new trail section starts next to the tennis courts at Mason Mill park and ends at North Druid Hills across from Spring Creek Rd. As noted by PATH last March, the "PATH design team has initiated design between Mason Mill Park and Clairmont Road near the VA Hospital. There are easements to be obtained and funding to be identified, but it seems promising we will have a trail from Mason Mill Park to the Emory campus during 2018." Same map as above, on a wider perspective. 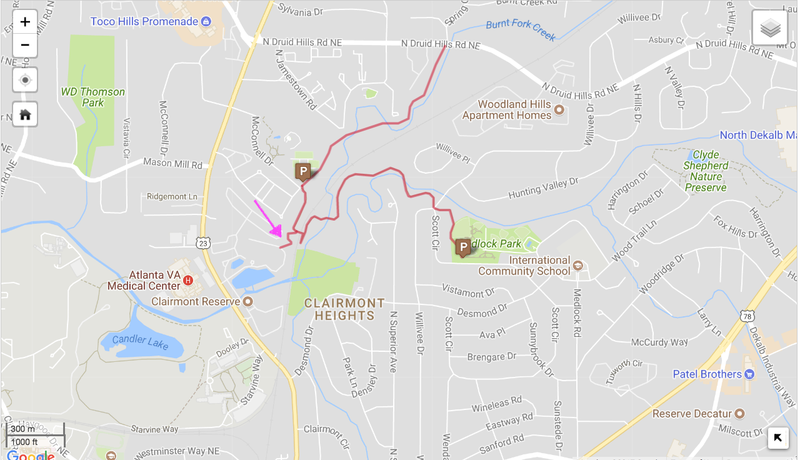 The pink arrow highlights a short leg of the trail that now connects to the Claremont Place senior/retirement community. Per the PATH website, "Future phases of this trail will continue to Emory University and north to North Druid Hills Rd. When completed the trail will allow bike/ped access from scores of neighborhoods directly to the Emory campus."